A few months ago, a group of our friends gathered to cook dinner. Being mostly from the United States (or having lived there), we were missing Mexican food, something that is difficult to find in Bangkok – at least if you want decent quality Mexican food and not something akin to Taco Bell. Thought I would share some pictures with you. The final spread, a mishmash of sauces, condiments, and dishes, all of which were very tasty. 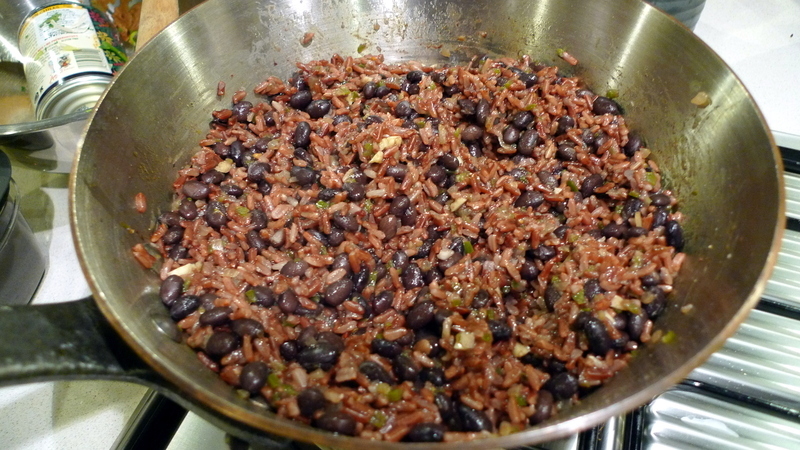 Home made black beans and rice with a soffrito – onion and pepper mixture. 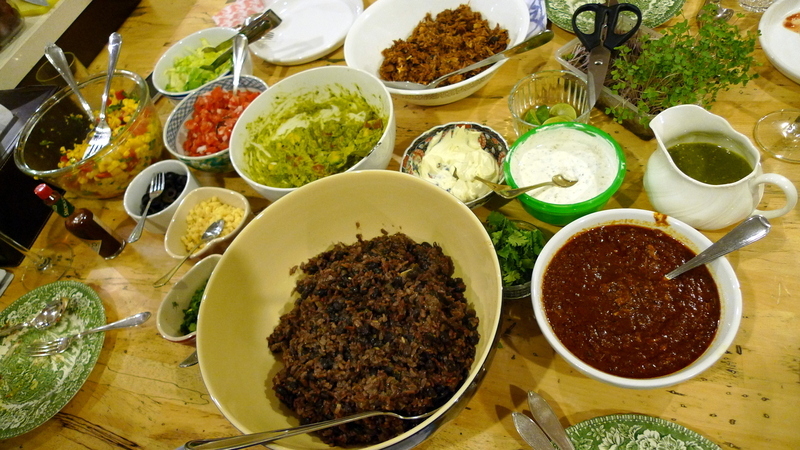 Put them all together and we wind up with a wonderful soft taco and side of black beans and rice. 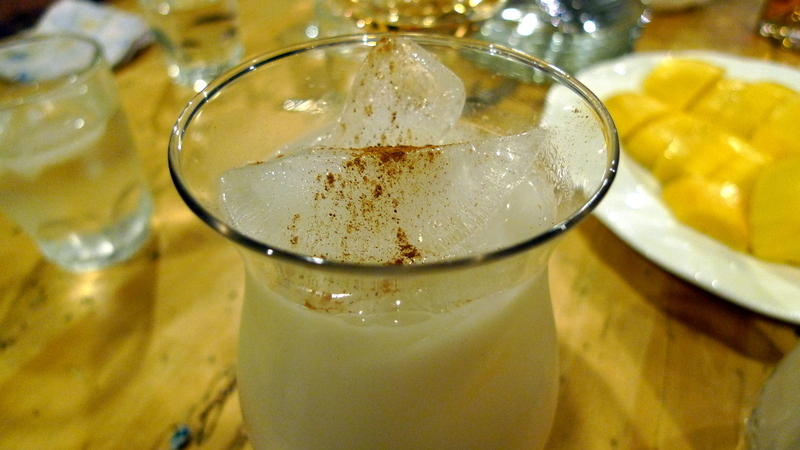 I also served homemade horchata, the traditional Mexican rice milk beverage. I followed a recipe on the internet which is based on one from the book “Paletas” by Fany Gerson. Can’t say if it is the authentic process, but the end result tasted familiar. 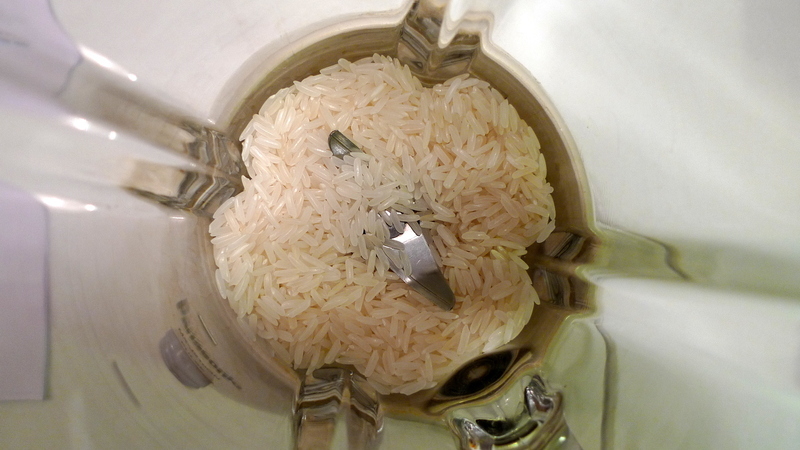 From left to right, blend the uncooked rice. 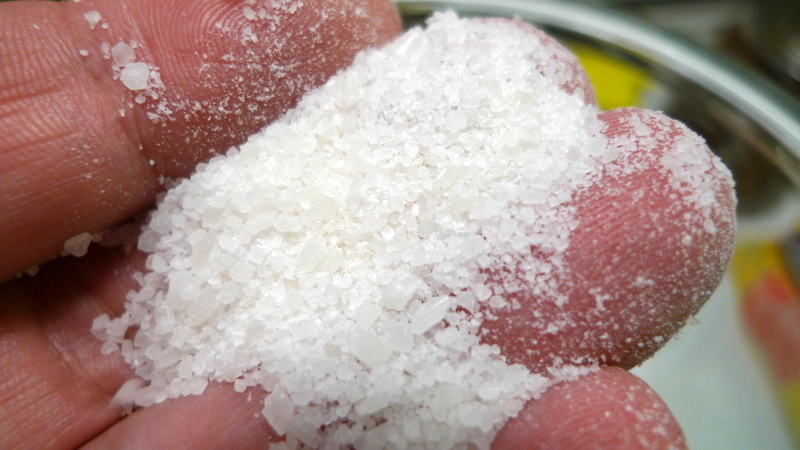 The result is a rough, sandy powder. 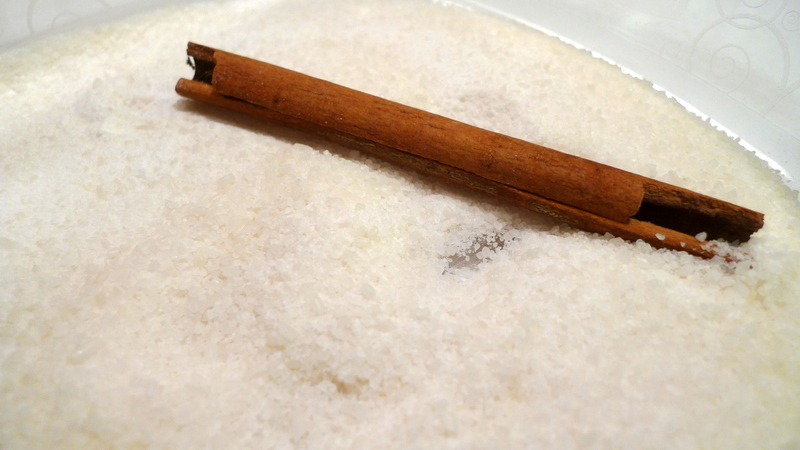 Put the powdered rice and cinnamon stick in a container and add warm water, letting it soak overnight. The next day you remove the cinnamon stick, puree the rice and water mixture, strain it to remove any solids, and then add sugar and rice milk (or cow milk) and mix until dissolved. Of course, adding rice milk at the end seems a bit redundant but as I said, the flavor turned out as I remembered from the taquerias of San Francisco. 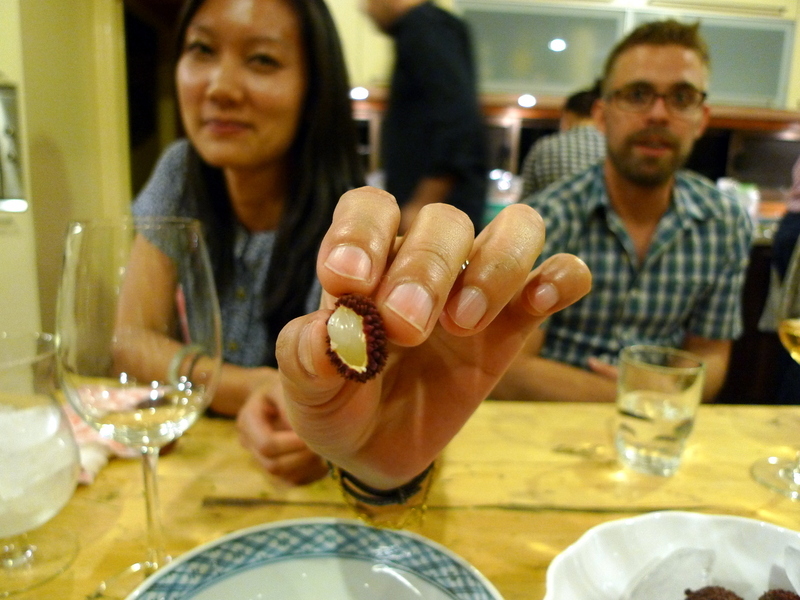 Candice shows us a baby lychee, the runt of a large batch of lychees we ate our way through. 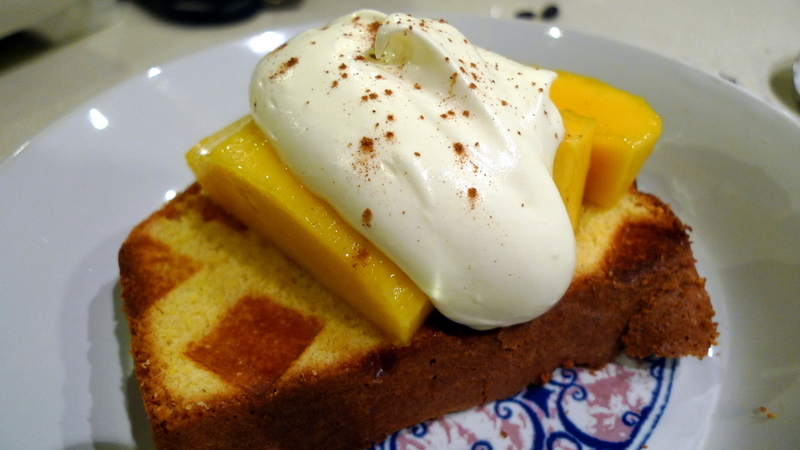 For dessert, I served mangoes on home made cornmeal pound cake. I brought my panini grill along and was going to grill the pieces. Unfortunately, I forgot that the waffle plates were in the grill instead of the panini plates. Undaunted, I used the waffle plates instead, which produced this interesting toasting pattern. End result of the dessert: curiously toasted cornmeal pound cake with mangoes and fresh whipped cream spiked with a touch of almond liqueur and a sprinkle of cinnamon. This entry was posted in Uncategorized and tagged cooking, cornmeal, food, horchata, Mexican, poundcake by christao408. Bookmark the permalink. I think I’ve only had Mexican food a handful of times…. I don’t remember, the Margaritas were the only thing I remembered. If I was in BKK, I would just sneak into your kitchen and munch away. That’s a delightful dinner, even with horchata! ¡Que Rico! if i were there, i’d be the first to lick clean that bowl of guacamole. i love avocados. Oh boy I knew I shouldn”t have taken off my bib. Totally yummy. You really need to get a gig at the Food Channel. I agree – the Food Channel can use you and your friends!! That dessert with the mango looks so o o o o good. You should have a tv show all by yourself and teach the world. Like Barefoot Contessa or Paula Dean. Flan is fairly easy to make. I would be lost trying to find tortilla and taco shells in Bangkok. A lot easier in Orange County. This looks wonderful! I love the look of the dessert. I think the waffle iron makes it much more festive. @Grannys_Place – Many thanks for the recommendation! @murisopsis – The waffle iron really did make for an interesting, if unconventional, pattern. @ZSA_MD – I don’t know that I would want to have a show, but I really like Ina Garten of Barefoot Contessa. Very relaxed, but elegant, style. @catstemplar2 – @Fatcat723 – Oh, my head is too shiny for TV. LOL@Ricardo98 – Tortillas are widely available at the western style grocery markets, some of the same brands as in the US, in fact, but made in Australia. Taco shells might be available, too, or you could make your own. I haven’t tried flan but should, huh? @ElusiveWords – And that is how I would recognize you. @beowulf222 – Just wine… strange, huh? @rudyhou – Noted for Hong Kong. @CurryPuffy – Si, senor. @BumbleBoTuna – Gracias. 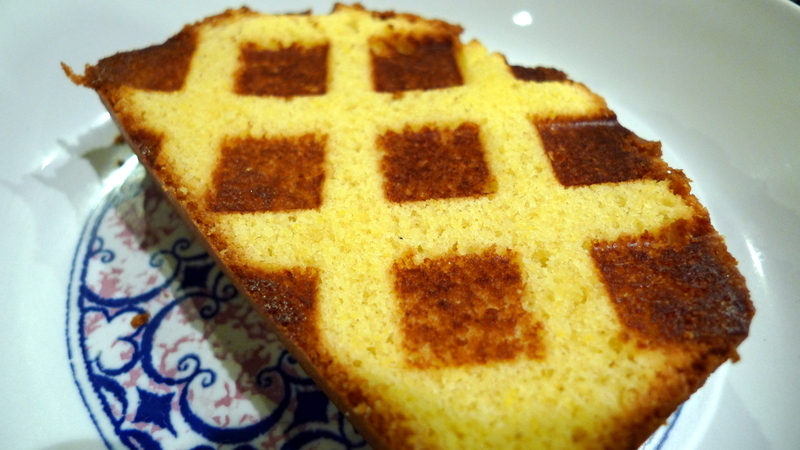 Cornmeal pound cake. That should be interesting. Would seem rather heavy. @grannykaren – Well, you could certainly substitute most any kind of bean. I’m quite fond of black beans myself. @Inciteful – Yes, it could be. It wasn’t all cornmeal, only about 1/3 cornmeal and 2/3 all-purpose flour. Gives it the taste and a bit of the texture without being heavy. well i’m definitely gonna be having some tacos this weekend now. lol. 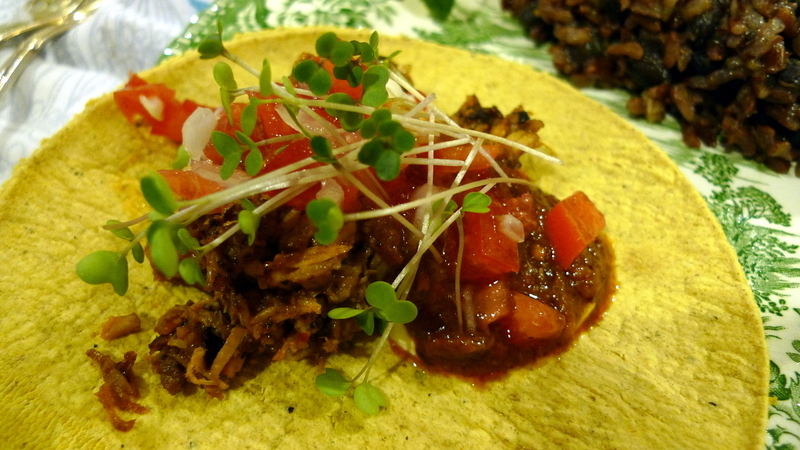 Your taco looks MARVELOUS!